One kilometer iron bar and 300 square meters white plastic. That was the material that project manager Jens Munk Clemmensen had chosen for the group of young artists who participated in the project Nordic Culture Camp in August 2018. The project was awarded a grant from the Culture and Art Programme and it culminated during Denmark’s biggest culture festival Kulturmødet when the young artists got a change to work together in order to create an artwork for the festival. The group of young artists consisted of members from Iceland, Finland, Norway and Denmark but also from Holland, Scotland and Italy. The 17 young artists represented different art forms and the group included for instance a performance artist, a media artist, a sculptor, a lighting artist and a poetry slam artist. Within the project they had to bring their artistic visions and skills together and create an artwork based on the main theme of the festival, “building bridges”. The co-operation resulted in an installation called Perspectives and despite the different backgrounds every artist’s input is visible on the final artwork. Perspectives takes also a stand on global challenges, such as climate change and global solidarity, and the poetry slam artist has written the artists’ statement on the white plastic surface of the installation. Clemmesen says that he is very proud of the young artists and the project has surpassed all his expectations. The group managed to create a good team spirit right from the beginning and the artists were eager to work together despite the different backgrounds and points of views. Every member of the group was equally committed to the project and everyone did their share. During their time together, the artists learned also about each other’s creative processes and the members had to reflect on their own ways of doing art in relation to the others. Working closely together creates permanent connections between young artists and exchange of experiences can also lead into new joint projects in the future. Tatu Heinämäki, a participant from Finland, says that the best part of the project was the incredibly good team spirit and the sense of solidarity within the group. Every participant has been heard equally in the process. ”It has been really interesting to see how an installation like this comes together. This process gives inspiration also for other projects in the future”, Heinämäki says. 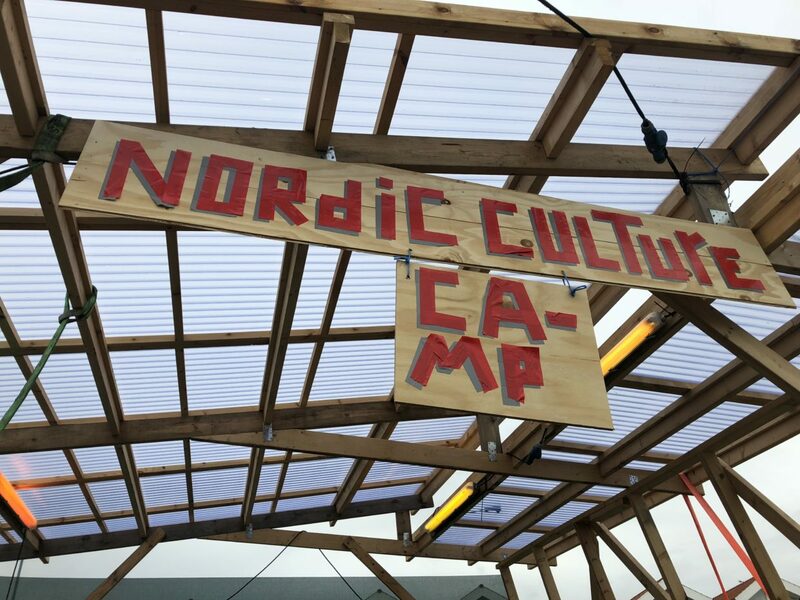 Nordic Culture Camp got good coverage in Danish media and the Danish minister of culture Mette Bock mentioned the project in her opening speech at the festival. The young artists participated in the festival program also by being involved in debates and discussions where they got a chance to tell about their own art making and their artistic visions. The Culture and Art Programme supports Nordic cooperation within art and culture. The programme grants support to projects within all areas of art and culture and funding can be applied for projects with artistic and/or cultural quality that promote a multifaceted and sustainable Nordic region. Open call: Do you want to create site specific art for the corridor wall at the Nordic Culture Point? News about events and the grant programmes. In order to provide you with a great experience on this site we provide the functionality to set your preferences for how this site runs when you use it. In order to remember your preferences we need to set cookies so that this information can be called whenever you interact with the page. For example whether the welcome banner is displayed on the main page is affected by cookies. We also use social media buttons and/or plugins on this site that allow you to connect with your social network in various ways. For these to work, the specific social media sites will set cookies through our site which may be used to enhance your profile on their site or contribute to the data they hold for various purposes outlined in their respective privacy policies.